Y Combinator-backed RescueTime is a web-based time management tool that lets users monitor the time they spend on the Web, like what applications and websites they’re visiting most frequently, all in an effort to help heavy web users cut down on inefficient uses of their time. (Maybe those three hours in Chrome Angry Birds weren’t adding to your overall productivity, friend.) The service can be used on an individual basis or by businesses — priced by number of users per month — to help keep their employees on track and focused. RescueTime’s awesome user-friendly service inspired a $900K investment from True Ventures, Chris Sacca, Tim Ferris and some other notable angels back in 2008. The company broke even in 2010, and has since been focused on building hockeystick-type growth. Today, RescueTime is cleverly expanding its service into complementary territory with a new feature called RescueTime Introductions, which offers a way for top talent to find jobs at top companies — and may very well excite that next round of funding. Back in 2006, RescueTime Co-founders Tony Wright and Brian Fioca sold their two-month-old startup called Jobby to Jobster. Unlike Indeed, Jobs.com, etc., Jobby offered a cool new approach to the hiring process by taking information directly from job seekers in an effort to help recruiters filter through job qualifications by offering a fast tagging and tag filtering approach. Wright and Fioca brought key members of the team with them to RescueTime (and even recently added Jason Grimes, who worked with Fioca at Jobster, as VP of Product Marketing) — and with RescueTime Introductions, the team is integrating its experience with the recruiting process into its web-based time management service. In today’s digital world, competition for highly skilled engineers is extremely high, and the companies that can find talent quickly have the best chance at recruiting that top talent before it’s snatched up by the competition. RescueTime is aiming to help those companies streamline the recruiting process, find talent that wouldn’t have thought to apply or might be (unhappily) working at another company, and remove inefficiencies that would turn away or turn off top people. Fioca told me said that the idea for Introductions came about because many of their friends at Y Combinator companies and local startups were continually asking them if they could recommend good programmers for their companies. It occurred to Fioca that the same methods RescueTime was using to screen its own hires during the interview process could be used on a large-scale, using the profiles of RescueTime’s 350,000 users. 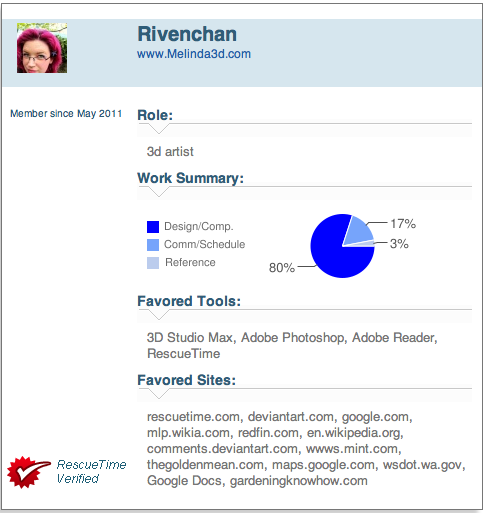 Thus, RescueTime Introductions aims to be the “Carfax report for candidates”. Instead of promising recruiters that it can find a candidate that is 100 percent perfect for a job, RescueTime Introductions narrows candidates down based on the right “cultural fit” and vouches for a candidate’s skill set, but of course, your company will still have to interview them. So, how does RescueTime it work? The service uses machine learning and pattern matching techniques to find matches between companies and employees based on “archetypes”; in other words, people are matched to companies based on the ratio of, say, time spent in productive categories, tools used, industry websites visited, research done, and so on. Fioca cited an interesting example, saying that it turns out using Aquamacs is a good indicator that someone is likely to be a great programmer. RescueTime Introductions downplays the importance of things like efficiency scores, downtime, distracted time, and so on, although Fioca did say that patterns in these areas can sometimes indicate that a person is bored in their current job and is looking for a new challenge. The startup currently has partner companies running RescueTime on their own teams to develop internal profiles of what working in particular positions within the company entails, so that Introductions will then be able to find matches based on those profiles, rather than having to post jobs or write confusing job posts on craigslist, for example. Fioca also said that privacy is the team’s primary concern. In doing some due diligence with current RescueTime users, 98 percent of them were favorable to the idea as long as they could control with information is shared with what people. Fioca said that RescueTime has been careful not to build a lead generation service for recruiters that they can then use to spam potential candidates without RescueTime intervention. “We’re calling it ‘Introductions'”, Fioca said, “because the idea is that we serve as the agent, spotting the top talent, and so we ask the user if they want to talk to a list of possible companies, making the handoff only once they’ve given us permission”. What’s more, none of the user’s usage data is shared with recruiters. Huzzah. RescueTime isn’t changing its model to be a recruiting company or selling recruiting software, it’s building a market where top talent can be introduced to top companies — if they choose to do so. And the best part? Fioca says that the team will only consider working with companies that they would want to work for themselves, which is why Dropbox, Twitter, Justin.tv, posterous, and eBay are among those they’re offering at the start. For a brief handshake with RescueTime Introductions, check out the video below, or visit the website in its office here.